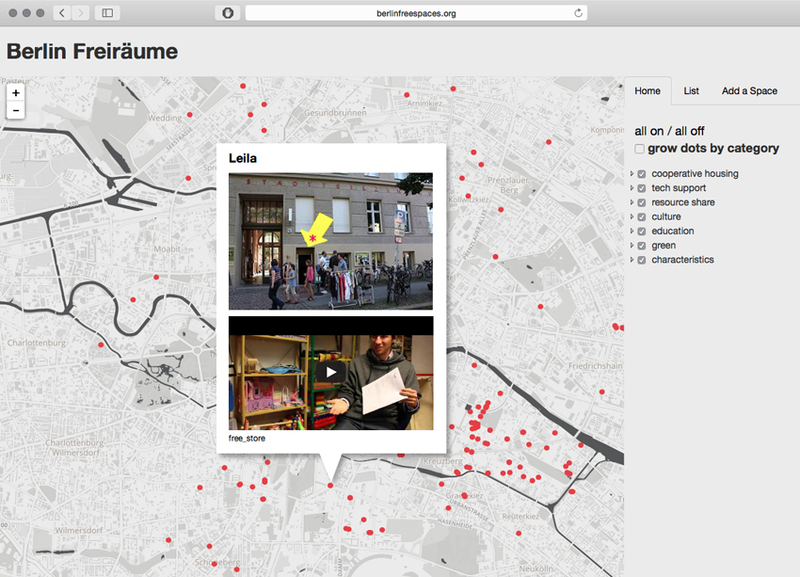 An internet-based map depicting various forms of Freiräume (‘free spaces’) in Berlin today, including Hausprojekts (legalised squats), Wagenplätze (trailer communities), co-housing, social centers, tool-shares, hacker spaces and community gardens, all of which engage in what is commonly known as ‘free culture’. Free culture is practised purposefully by social and political movements as well as ‘non-politically engaged’ people every day. The map allows users to find spaces that match certain criteria, and also narrow down to their particular areas of interest, such as community meals, wood/metal-working spaces, free building materials, film screenings, guest rooms and donation-based health and legal counselling. So far, they have plotted 230 spaces on the map. They have 60-100 more spaces yet to add, and they expect the map to grow when they make it available to the public as a Wiki. To provide a tool for connection, historical analysis, and community organising between autonomous, DIY, and/or ‘free’ spaces. To chart spaces which exist either in opposition to, or somehow otherwise wedged within the cracks of capitalism. To explore the edges between subcultures and spaces with different agendas and the even greater 'edge' where the illusive mainstream and the countercultural meet. In addition to the many concrete uses of Freiräume Map Berlin, the map also provides affirmation and inspiration as a counter-power to the dominant narrative that free spaces are on the decline. During the course of the research, the project identified approximately 200 more spaces than usually encountered in day to day life. It is the hope that users of the map will have a similar experience and become inspired to make new connections.